Gerry Taylor reporting for duty. Gerry Taylor is enjoying kitting himself out in a different uniform after calling time on his 26 years in the police force. 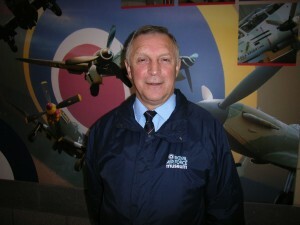 Working life these days takes him to the busy museum at RAF Cosford, where he undertakes a variety of different roles. “We look after the exhibits and the public, and help organise some special events,” he said. “There are also the health and safety aspects which we all have to adhere to in this day and age but it’s interesting work and I’ve been here five years now. “I do wear a uniform, although it’s fairly casual and the environment is obviously more relaxed than in the police. 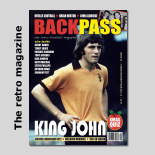 Taylor is one of the lesser-known Wath Wanderers, heading south from his native Hull with Bob Hatton in the mid-1960s and making his debut in a home draw with Ipswich on New Year’s Day in 1966. 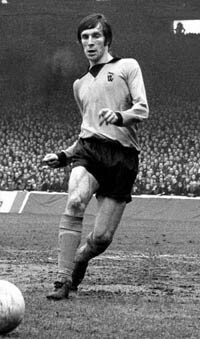 He played another 16 matches in that Second Division promotion-winning campaign and, despite often being an understudy to the likes of Joe Wilson, Bobby Thomson, Bernard Shaw and Derek Parkin, amassed 192 first-team matches in his Wolves career. In action in the 1973 FA Cup semi-final at Maine Road. 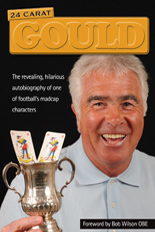 Although he played seven games in the 1971-72 UEFA Cup run, including both legs of the final against Tottenham, his best season was the following one, in which he played no fewer than 49 matches in League and cups. He later served Swindon on loan before playing for Cannock Police and Staffordshire Police after his retirement as a professional. Posted on: Monday, September 8th, 2008.